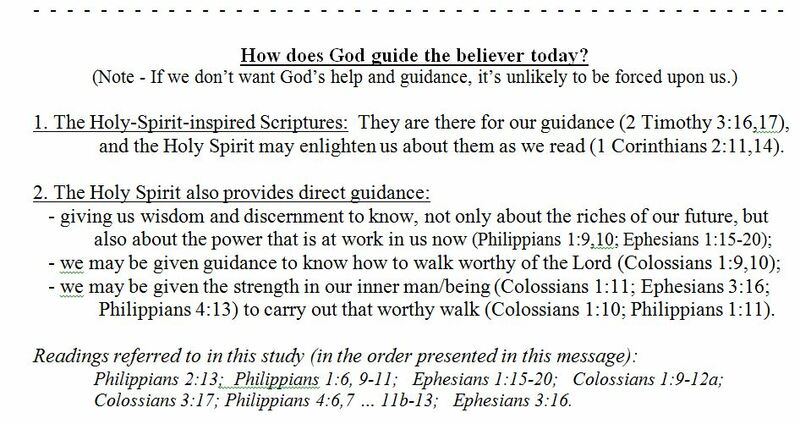 Summary: Considering the role of the Holy Spirit as a guide in the life of the believer today. In previous studies we’ve been focussing on various roles of the Holy Spirit in the life of the believer today. An Enabler, a Revealer of Truth, a Guide. In the last study we began considering the aspect of the Spirit being a guide to us. We started by thinking how God guided His people in earlier times, and kept on coming back to a passage in Deuteronomy ch 4 that reminded the children of Israel of the importance of the written Scriptures, particularly the Law, as a guide to their walk. That passage reminded them that God was near, but that the Law should be their guide for their everyday lives. In the Gospels Period, the Lord was a guide to His disciples. In the Acts Period, He sent them “another” Paraclete, providing comfort, strength and guidance - as well as the roles of enabling miraculous deeds, and revealing God’s truth, aspects we’ve looked at in earlier studies. Every piece of guidance was in accordance with the Scriptures, and complemented the previously revealed Scriptures. Today's Christian should not look for guidance in miraculous outward ways, like the manifestations of the Spirit in the Acts Period (“manifestation” in 1 Corinthians 12 – phanerosis – an outward display of the Spirit’s work). Rather, the Holy-Spirit-inspired Scriptures are to be our guide.…profitable for doctrine, reproof, correction and instruction in righteousness, so that the man of God may be thoroughly equipped … 2 Timothy 3:16,17. But there is another aspect to the Holy Spirit’s guiding work - a work in the "inner man" that we haven’t discussed yet – and we will do that in this study. How does the Holy Spirit guide us? (1) Which are the ones we are given guidance about in the Scriptures? (2) Which ones would we expect to be given guidance from God's Spirit about? (3) In what manner would we expect any divine guidance to come? How will the Holy Spirit be a guide to us in these issues? 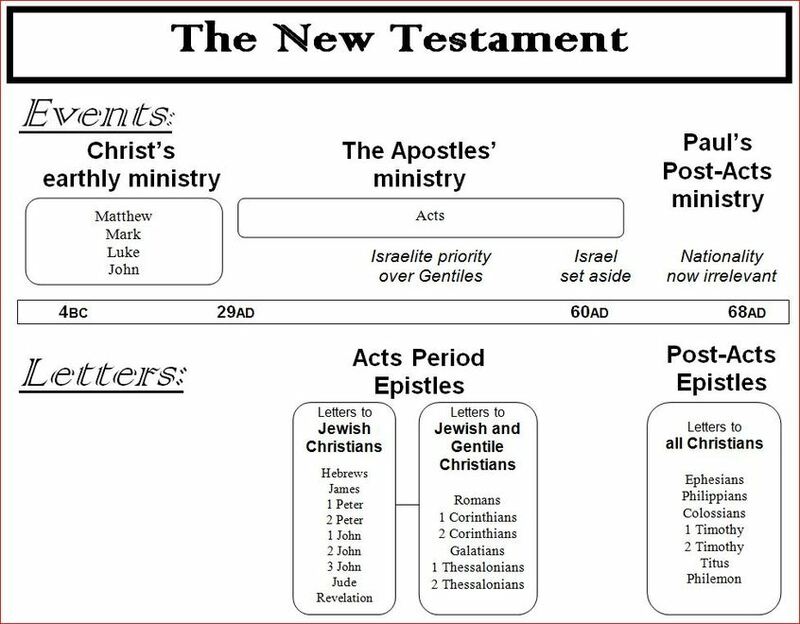 Let's look at some Scriptures first - mostly from three of the later letters of Paul: Ephesians, Philippians and Colossians. energeo (and words related to it) is a word linked with the Holy Spirit's work, especially as seen in Ephesians 1:19,20. Here, the work is to do with the bestowing of knowledge and wisdom (perhaps similar to the way that Solomon was divinely given wisdom). For what purpose is this given? For the purpose of discernment .... to produce fruits of righteousness. This is my prayer in preparing these studies - that we might know something of the power at work (energew) in us (v.19b) - the power of the Holy Spirit. This is the same power at work (energeo) when Christ was raised from the dead). The power is at work in us now, able to provide strength in our inner being, and enlightenment of God's Word. Look over that list of life decisions again, in light of what the Scriptures say about the guiding work of the Holy Spirit. Being "filled with the knowledge of His will" is not so much about what career path we should take, what car we should buy or what type of house we should live in. Rather, it is more about how we go about making the decisions we are faced with - making these decisions in a way that pleases God; i.e. not being too selfish, dealing in an honest manner, exercising patience and joy, being thankful in whatever situation we find ourselves, etc. 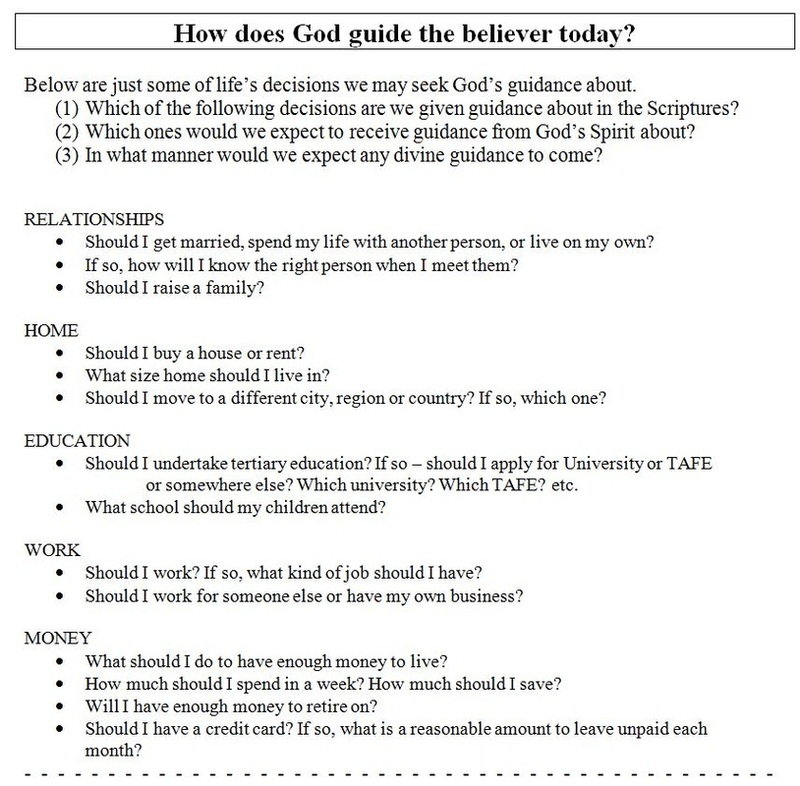 So, how does God guide the believer today? (2) Through direct guidance from God's Spirit.